The multi basket strainers and multi bag filter housings from Rosedale offer a wide range of flow capacities and contaminant-holding capabilities. They contain from 2 to 23 baskets. 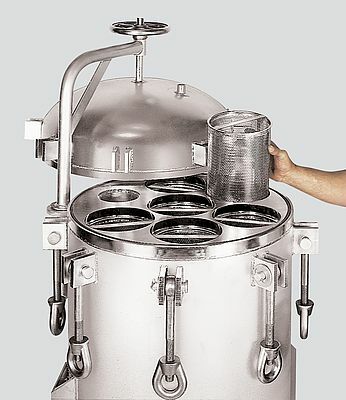 To serve as a strainer, a unit is ordered with perforated stainless steel baskets (mesh-lined if desired). When ordered as a filter, it's fitted with perforated stainless steel baskets designed to hold filter bags or pleated cartridges. Industry-standard size bags are used: the standard 30inch baskets accept bag size 2, the optional 15inch baskets take size 1. The standard pressure rating for all models is 150 psi. 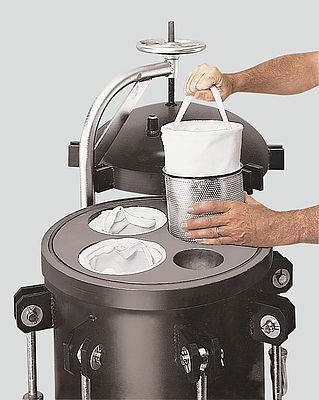 All multi basket strainer and multi bag filter housings can be supplied with an ASME code stamp, if required. Quick Access Cover (QAC) features a clamp and spring assisted hinged cover that is quick and easy to open and close with no tools required. This will significantly reduce change-out time and lower operating costs. The QAC is rated to 150 PSI and constructed to meet ASME code requirements. Built-in safety features ensure that the cover cannot be opened unless the internal pressure is first released. The QAC is offered with our low profile design making bags more accessible and easy to remove. Low Profile Design (SLP) Housings are compact and space saving, allowing for ease of bag change-out. Standard operating height is reduced, resulting in a safe design by eliminating platforms and ladders. The SLP is manufactured in any housing version, including our standard davit arm cover, QAC design, and spring assisted hinged cover. Spring Assisted Hinged Cover (HLP) opens and closes without effort. Simply loosen the swing bolts and lift the cover up to open. An automatic cover stop is provided. This design saves time by eliminating the labor intensive handwheel. It is offered standard with our low profile design, or can be ordered in the QAC design. Standard Housing Design (STD) is durable and economic. It includes a davit arm and handwheel to facilitate cover removal. It is our most versatile housing design offering a variety of options, including our low profile design. All multi-basket models described here are also available as duplex filters for duplex filtration systems. Two units come piped together with valves to permit continuous use of either unit while servicing the other. One lever actuates all valves simultaneously or it can be ordered for automatic service. Rosedale's NCO stainless steel housings are electropolished to resist adhesion of dirt and scale. The adjustable height legs are standard, ASME code stamps are available. Rosedale Products is a technology developer in the field of liquid filtration systems and waste minimization products for customers around the globe. Their product line includes high performance filtration solutions for multiple industries. Rosedale Products is a technology developer in the field of liquid filtration systems and waste minimization products for customers around the globe. The product line includes high performance filtration solutions for multiple industries.